The Castle Crags loom large across the Sacramento River Canyon. The Crags figure prominently in the climbing guide. It is probably evident from the content on Hikemtshasta.com that I am a hiker. Although I dabbled in rock climbing earlier in my late teens and early twenties, it is not something I have much interest in pursuing at this point in my life. Of course, I have tremendous respect for those who participate in the sport and I am fascinated by the challenges that climbers have to overcome on longer routes. It is with this respect and fascination that I want to recommend the rock climbing guide, Mt Shasta Area Rock Climbing – A Climber’s Guide to Siskiyou County , which was recently published by my friend Grover Shipman. This is by far the most comprehensive rock climbing guide for the Northstate. 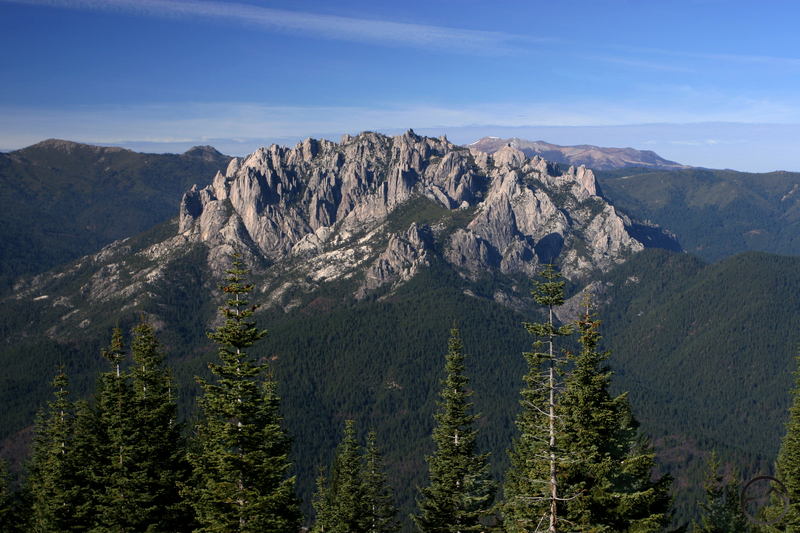 As the title states, it covers crags all over Siskiyou County including several little known gems. However, the real heart of the book is Grover’s documentation of the incredible climbs in the Castle Crags. He went so far as to charter a helicopter to photograph hard to see areas. There is no other book like it. While great care and effort went into the description of rock climbing in the Mount Shasta area, Grover also put a lot work into gathering and documenting the natural and human history of the region and put together what is probably the first comprehensive account of the development of rock climbing in the area. With all the extra information, it is a great resource for anyone interested in the Mount Shasta area, not just for rock climbers. I heartily recommend the book. Along with the book, I wanted to include a link to Grover’s new blog, Siskiyou County Outdoors. He is just getting it started but it has already has lots of great information on it. He is always eager to answer questions and is very friendly. Drop him a line!